June 11, 2018 06:57 ET | Source: Equinox Gold Corp.
VANCOUVER, British Columbia, June 11, 2018 (GLOBE NEWSWIRE) -- Equinox Gold Corp. (TSX-V:EQX) (OTC:EQXGF) (“Equinox Gold” or “the Company”) is pleased to announce additional positive results from the Piaba West infill and step-out drill program and that drilling is underway at the Tatajuba target, both located at the Company’s 100%-owned Aurizona Gold Mine (“Aurizona”) in Brazil. 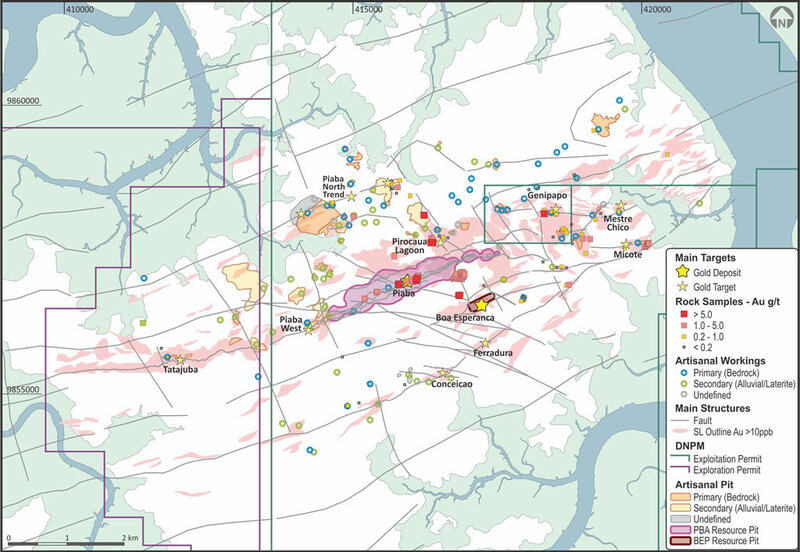 A total of 115 step-out and infill drill holes (16,084 m) were drilled in the Piaba West area during 2017 and early 2018, demonstrating that mineralization extends up to 350 metres (“m”) along strike to the west of the existing Piaba reserve pit and at depth below the shallow western end of the pit. Drill results are being integrated into an updated Mineral Resource Estimate that is expected to be complete in Q3-2018. Results from the final 30 drill holes (5,045 m) continue to highlight the resource growth potential at Aurizona. The Tatajuba target is the western extension of the main Piaba Trend that hosts Aurizona. The target measures over 4 km in length as defined by coherent gold-in-soil anomalism, geophysics (magnetics), auger drilling and limited diamond drilling. The initial 1,500 m drill program will focus on an approximately 600 m long portion where historical drilling intersected significant shallow gold mineralization including 13.7 g/t Au over 35.0 m (D250) and 2.7 g/t Au over 55.6 m (D114). Equinox Gold is a Canadian mining company with a multi-million-ounce gold resource base, near-term and growing gold production from two past-producing mines in Brazil and California, and a diverse portfolio of gold and copper assets in North and South America. Construction is underway at the Company’s Aurizona project in Brazil with the objective of pouring gold by year-end 2018, and a prefeasibility study is underway at the Company’s Castle Mountain project in California with the objective of restarting production. Further information about Equinox Gold’s current portfolio of assets and long-term growth strategy is available at www.equinoxgold.com or by email at ir@equinoxgold.com. Scott Heffernan, M.Sc., P.Geo., the Company’s EVP Exploration and Qualified Person under National Instrument 43-101, has reviewed and verified that the technical information contained in this news release is accurate and approves the written disclosure of the same. Drill composites were calculated using cut-off values of 0.3 g/t, 1.0 g/t or 5.0 g/t gold as specified in the drill table and contain no more than 3 metres of internal waste. Drill intersections are calculated using uncut assays and are reported as drilled thicknesses. True widths of the mineralized intervals are interpreted to be 60 to 90 percent of the reported lengths. All samples were submitted to ALS Chemex in Belo Horizonte, Brazil for sample preparation. Sample pulps were then sent to ALS Chemex in Lima, Peru for geochemical analysis for gold by fire assay of a 30-gram charge with an Atomic Absorption finish (AA) and for a 33 multi-element geochemical suite by 4-acid digestion and Inductively-Coupled Mass Spectrometry (ICP-MS). Samples with AA gold values over 10.0 g/t are re-assayed by Screen Metallics fire assay. Control samples (accredited standards, blanks and duplicate samples at the field and preparation stages) were inserted on a regular basis. Results were monitored upon receipt of assays. This document contains certain forward-looking information and forward-looking statements within the meaning of applicable securities legislation (collectively “forward-looking statements”). The use of the words “will”, “expected”, “expectation”, “objective”, “underway”, “potential”, and similar expressions are intended to identify forward-looking statements. Forward-looking statements contained in this news release include, but are not limited to, statements regarding the exploration strategy and potential at Aurizona, production potential from the Aurizona Gold Mine and Castle Mountain Gold Mine, the Castle Mountain prefeasibility study, the potential for other assets of the Company, and the long-term growth potential of the Company. Although the Company believes that the expectations reflected in such forward-looking statements and/or information are reasonable, undue reliance should not be placed on forward-looking statements since the Company can give no assurance that such expectations will prove to be correct. These statements involve known and unknown risks, uncertainties and other factors that may cause actual results or events to differ materially from those anticipated in such forward-looking statements, including the risks, uncertainties and other factors identified in the Company’s periodic filings with Canadian securities regulators, and assumptions made with regard to the Company’s exploration strategy at Aurizona; the results of Aurizona exploration and the impact of Aurizona exploration; the Company’s ability to complete the Castle Mountain prefeasibility study and the results of the study; the Company’s ability to complete construction at Aurizona and the timing to achieve production; and the Company’s ability to achieve its expected growth and production potential. Furthermore, the forward-looking statements contained in this news release are made as at the date of this news release and the Company does not undertake any obligations to publicly update and/or revise any of the included forward-looking statements, whether as a result of additional information, future events and/or otherwise, except as may be required by applicable securities laws.